A difficult exam question shows how visible and NMR spectroscopy related to long-term misassignment of the structure for the triphenylmethyl dimer. Evidence from 1970 shows that Friedel-Crafts propylation involves an SN2 mechanism, not a protonated cyclopropane. Assigning oxidation states from -4 to +4 to the carbon atoms of proposed starting material and product allows choosing whether a reagent that is oxidizing or reducing or neither is appropriate. Beyond belonging to the appropriate redox class, the reagent must have an appropriate mechanism. Alcohol oxidations by elemental bromine and by Cr+6 reagents are shown to involve familiar substitution, elimination, and addition mechanisms. Mechanistic understanding allows adjusting conditions to make oxidation selective. Professor J. Michael McBride: OK. The exams will be ready on Wednesday. They’re not ready now. So we’re talking about oxidizing and reducing reagents, and about alcohols, and Grignard reactions to make them. And if we have time at the end, we’ll get to a little bit about green chemistry. I maybe should apologize a little bit about the last question on the exam. I got carried away. I wanted to have something that was relevant, at least historically relevant. So I could have chosen a better NMR problem, probably. But I wanted to show you why it’s a neat story. So I showed you, during the exam, this dissertation from the University of Michigan in 1921. And notice it’s about the color of free radicals. It was found originally that the solutions were colored. Have any of you ever had a colored solution in lab? Have any of you ever not had a colored solution is lab? Right? They’re always colored. So at first, people paid no attention to it. But after they got good at doing it, they observed that the solutions were colored sort of a reddish yellow. But when you swirled the thing, the color went away. It was colorless. But then it came back. Then you swirled it again, it went away. Came back. Went away, came back, went away, came back, several times. And so this was something that required an explanation of what the color was and how it went away. So on page eight of this dissertation, there’s this thing up on top that has sort of a complicated scheme– or it seemed so at the time, at least– to explain the color. So the idea is that A– what compound is A in this? Can you see what it is? Professor J. Michael McBride: A, up at the top left in the scheme. It’s triphenylmethyl-triphenylmethyl. It’s hexaphenylethane, right? That’s what Gomberg set out to make, remember? And then what’s to the right of it, what’s B? It’s two triphenylmethyl radicals. That’s what he decided he had made, on the basis of their reactivity. But he’s drawn something else here. Down below it, he explains the color by drawing what we would regard as a resonance structure of the free radical, which puts the radical out on the para position of one of the benzene rings, and draws other double bonds there. And the theory then was that when you had that double bond, and two double bonds conjugated like that, that caused color. So he explained the color by saying that it was what we would say a resonance form, but he said in equilibrium, a form that was colored. And the idea was that the radical was colored, but very reactive. But it was in equilibrium with the dimer, and the dimer was not colored, like tetraphenylmethane was not colored. But the monomer reacts quickly with oxygen. So when you swirl the flask and let oxygen get into the solution, it immediately destroys the colored stuff– that. in his opinion, the quinoid form, these double bonds, right, the resonance structure we would say. But it destroys the free radical, then exhausts the oxygen. Right? And then if you let it sit a while, the color comes back, because equilibrium between the dimer and the monomer reestablishes itself, so the color gets back. But if you swirl it again, you get oxygen, and it destroys it. You can keep doing that until you’ve used up all the radical. So that’s how color got into the act. Now, the NMR I asked you to explain, and a number of people got it, is… The dimer of triphenylmethyl was finally measured by NMR in 1968. And here’s a spectrum of it. And you see, it can’t possibly be hexaphenylethane, because it’s got one group of 25 hydrogens, another of 2, another of 2, and another, 1. Right? So if we look at hexaphenylethane, of course, it should have six phenyl groups. Six times five is thirty. There should just be that one peak. So this obviously isn’t that. What is it? That hexaphenylethane is the product of alpha-alpha coupling, the two radical carbons coming together. But notice what could have happened. It’s obviously not that. But if you had the triphenylmethyl radical up there at B, and if we use a line instead of a dot to denote the extra valence that’s not being used, and over here, draw the resonance structure, which has its extra valence out at the right, then you could imagine– those, of course, are just resonance structures– but you can imagine two of them coming together like that to form this dimer. So a different dimer. What advantage would it have over… what disadvantage would it have compared to hexaphenylethane? How about this ring here? We’ve lost the aromatic stability of the ring. What have we gained? So that’s a way in which this dimer would be worse than hexaphenylethane. Is there any way in which it would be better? Professor J. Michael McBride: It’s less spherically hindered, right? And spheric hindrance counts for a lot in these things, although that wasn’t much appreciated, really, until after 1950 or so. I mean, people had talked about it since the time of Viktor Meyer, but it really didn’t convince anyone that you should think about another dimer rather than hexaphenylethane. So anyhow, if you consider this structure, notice that you have the explanation for two hydrogens here, the blue one, two hydrogens here, the green ones, a hydrogen here, the red one, and you have coupling between these two of about 10 Hz, so it’s a double doublet, right? And it’s distorted, though, because this 60 MHz spectrum, the chemical shift difference, isn’t large compared to the J-coupling. So the inner peaks are large, and the outer peaks are small. But if you look even more carefully, you can see that there’s a 3 Hz coupling between the red hydrogen and the green. There’s a little bit of doublet splitting here and a little bit of doublet splitting here. It’s hard to see. And in fact, in some related samples, you can see a little coupling between this hydrogen and that one, as well. And these, therefore, are a little bit split, but not enough that you can see it. Why don’t you see the splitting in that one? If A splits B, B should split A, right? Because this hydrogen is being split into a triplet by these, and into a small triplet by these, only 3 Hz, and then into even smaller triplets by these. So it’s just a whole bunch of peaks on top of one another that just look like a lump out here. So it’s quite clear what this structure is, that it’s this quinoid dimer, once you have the NMR to see it. So it’s an α-to-para coupling. The central carbon, α, right, with the para position to one of the benzene rings, which avoids the steric hindrance. Now, how about the color? Remember, the reason Gomberg thought that it was this, was that the radical was colored, the stuff that went away rapidly when you swirled it. But the stuff that was in equilibrium with that was not colored. That’s why the color went away, but came back again when the equilibrium was reestablished. So the stuff it was in equilibrium with was not colored. This, he thought, should be colored. Right? So he thought it couldn’t be that dimer. And he was almost right. This is the UV spectrum of that stuff. So it has quite a strong absorbance here, at 318 nm. But it peters out just at 395 nm. And as it turns out, the ultraviolet, the invisible part of the spectrum, ends at 395 nm. If it’d been 5 nm more, he would have seen the color of that with his eye. So he was close but no cigar on that one, right? And because of that, for whatever it was, 46 years, people had the wrong structure of this important compound. Now in fact, that’s at minus 60° where the equilibrium lies toward the dimer, away from the monomer. But if you warm to 21°, now you see the absorption from the monomer. There’s enough of it to see. That’s at 513 nm. And the reason it’s colored is not because it has this quinoid structure, which was his theory, but because it has a non-bonding SOMO. So normally you have bonding and anti-bonding orbitals. π and π* are conjugated ones, right? But this one has a non-bonding orbital right in the middle, so a much smaller gap, so the energy is much lower, of the quantum that gets absorbed by the free radical. Now, this was published, that thesis that appeared here, was published the next year in the Journal of the American Chemical Society, almost word for word, about the color of the free radicals. And this is a passage of that. It says, “The relationship between color and constitution of triphenylmethyl are, briefly stated, the following. First, that you have a colored free radical in equilibrium with the dimer”– hexaphenylethane, right?– “and second, the color is attributed to the quinoid tautomer”– we would now say resonance structure– “C.” So the color was attributed to that. But notice what’s interesting about taking this paper from the dissertation to the printed form in the Journal of the American Chemical Society, the published form? What got left out? The correct structure of the dimer. So it was intentionally left out because of the color thing. The correct dimer was dropped for 46 years, because they thought it should be colored. And it just almost was. So I think that’s an interesting application of spectroscopy. OK. Now, third thoughts on the Friedel-Crafts reaction. Remember, we had thoughts, we had second thoughts, now we have third thoughts. And the second thoughts, just to remind you, was that when you do a Friedel-Crafts reaction, you could imagine benzene being a nucleophile and displacing chloride from n-propyl to give n-propyl benzene, and that would be an SN2 reaction. Or you could imagine if it broke the bond a little more that the hydride could shift, and you’d get isopropyl, either with an aluminum chloride tightly associated with it, or since it’s a secondary cation, maybe much looser. So that would be like an SN1 reaction that allowed the rearrangement. But then we wondered, what would happen if we rotate it and had a methide shift instead of a hydride shift? Then, if we had the rearrangement, we’d get the same thing back again. It would still give n-propyl. So the question is, is it SN2 or is it SN1? And then there was this additional complication that if the methyl got stuck halfway in a cyclopropyl – protonated cyclopropane structure, that still would give the n-propyl benzene. And in fact, Deno found in 1968 that you did that, and that it was randomly distributed, because the hydrogen can zip around the periphery of the protonated cyclopropane. OK. So then I posed to you a way to become famous, a problem. How to decide whether the Friedel-Crafts reaction really is an SN2, where benzene is a nucleophile and displaces chloride from a thing like this, either before or after the methide shift, or whether it’s an SN1 reaction. Did anyone have an idea how to solve that? Yeah, Matt? Professor J. Michael McBride: We could label to see where the deuterium ends up in the n-propyl. And what I’ve found since I posed you this way to become famous was that somebody actually did that experiment. Right? It was done two years later, in 1970, and it didn’t make them famous. The paper has been cited only twice in the succeeding 40 years or whatever. And it was done by Lee and Woodcock in Saskatchewan in 1970. So they prepared the one with deuterium here, and they did the reaction with aluminum chloride right at 5°C for 45 minutes. That’s near the freezing point of benzene, so it’s about as cold as you can get, if you’re going to use benzene is a solvent. They also did it with another inert solvent. The idea is that the nucleophile would then be more dilute, the benzene that’s doing the thing. So it would slow down the displacement reaction if it were an SN2. OK. So what would you expect if it had been an SN2 reaction without any rearrangement? If it had just been benzene being a nucleophile. The only thing aluminum chloride does is help the chloride be a good leaving group. Then where would the deuterium end up? Here, here, here; one, two, three. Ashvin, what do you say? You just did the exam. You should be primed on this. Student: Next to the ring. Professor J. Michael McBride: It should be here, right? Because if benzene just comes and attacks this carbon, and chloride leaves, then the deuterium should all be there. What if it undergoes a methide shift? Then where would it be, Ashvin? The deuterium, remember, started here. And then the methide shifted, if that’s the mechanism. Yeah? Professor J. Michael McBride: Then it would be here, right? And what if it went through a protonated cyclopropane? Professor J. Michael McBride: Then it would be scrambled. We already know what protonated cyclopropane would be. So now by studying where the deuterium is, we should be able to figure out what the mechanism is to give n-propyl benzene with n-propyl chloride. And what they found was that 90% of the product was dideuterated there, and none of it was dideuterated elsewhere. So it really is the case, then, that there’s less than 2% of partial or full methide shift en route to n-propyl benzene. It’s just the simplest thing you think, that it forms by a benzene nucleophile doing an SN2 reaction. Now, why isn’t it 100%? Because other cations are able to abstract hydride from this position to make this cation here, and then the deuteriums get washed out of the molecule. But anyhow, that’s what they found. So you’ll have to find out some other way to become famous as an organic chemist. Now, at the end last time, we were doing oxidation and reduction as bookkeeping. Not because there’s anything real about it, but because it can help us to classify reagents. We’ve been classifying reagents as high HOMOs, low LUMOs. Weak bonds, for example, if you want to get a free-radical reaction. But there’s a completely different way of classifying them, in a sense, a very artificial way, as to whether they’re oxidizing or reducing agents. So we went through a whole bunch of reagents and classified them. As oxidizing reagents, the elemental halogen, disulfide, chromium trioxide. Reducing agents, methane is a reducing agent. But it’s not very reactive, because it doesn’t have good HOMOs or LUMOs. Free radicals are what we need to get a foothold on that. Or lithium aluminum hydride, H-. NaH, potassium metal, which can give up electrons. And RSH can give up H-, and we saw that when you oxidized back and forth between disulfide and thiol. But HCl and KCl, the elements are in their normal oxidation states, so they’re neither oxidizing or reducing. And just at the end, we got to water and showed that in water, hydrogen is +1 and oxygen is -2. So it’s neither. And in fact you can see that in the reaction of water with ethylene, catalyzed by acid. The carbon is -2, -2 for ethylene. After you’ve added, it’s -1, -3. So one carbon got oxidized, but the other carbon got reduced. And there’s no net change, so you don’t need either an oxidizing or a reducing agent, because there’s no net change in the oxidation step. So water can do that. But water does work in oxidizing-reducing scenarios. And in particular, a very important one, photosynthesis, changes – oxidizes water to O2, but at the same time reduces the hydrogen in water to the equivalent of H-. And that’s NAD takes up the H to become NADH. And remember, we’ve talked about that being a source of hydride, H-. So it gets both oxidized and reduced. So not all reducing agents would work satisfactorily for any given reaction. But it’s typically futile to try a reagent from the wrong class. You don’t usually use bromine if you need to do reduction. Right? Or hydrogen chloride if you need to do either oxidation or reduction. So it can be a big help in narrowing the field, in choosing reagents. Now, I wanted to go to the board a little bit to show oxidation states. This was done in the class last year by Professor Siegel from Zurich. But I thought it was handy to do, and I will do it again on the board here. So let me just put this screen up. OK. So we’ve talked about arranging– there’s one other set. There we go. Now, he chose to use CH4, CH3OH, CH2O, formic acid and CO2 as examples of oxidation levels of carbon. Let’s just do it a little differently, not that it’s better or worse, but let’s just have an R on there. Professor J. Michael McBride: Oh, -3, pardon me. Thanks for being on your toes. Then we could have RCH2OH. So the oxygen cancels one of the carbons, so this will be -1. Notice we’re going in steps of two here, right? It’s the same when up there, but I’ve decided to put an R on, instead of one of the Hs, just for variety. So now RCH=O. Now it’s +1, because you have two oxygens, one hydrogen. Then we could go RCOOH. A carboxylic acid. Now it’s +3. And at the very end, you can go to CO2. Then you don’t have the R in there. And that’s +4, as it says up there. OK. Now let’s look at different classes of compounds at their levels of oxidation. So we could have alkanes. So we could have– well, we’ve already got RCH3. That’s -3, so we’ll check that one. And then we could go to alkyne. R, C, C, R. So this would be alkyne. And each of these is -1. Overall it’s -2. And each of these is zero. Now, what this means is that if you wanted to get an alkene, it has the same oxidation level as the alcohol. I got that right? Actually, I should have worked this through better ahead of time. That one works better in his scheme. But notice that you can… or another alkene would be RCH=CH2. So this one, you can get from here just by a reaction we know. What’s the reaction that would go from the alcohol to the alkene? How do you get there from here? What do you call that reaction? To start with an alkane.. Pardon me. This will be R’, because this C is part of the R here. So this one involves an elimination reaction. You just treat it with acid. You don’t need an oxidizing or reducing agent. So the idea is that you can go down this way with neither, but if you have to go back and forth this way, you do oxidation or reduction. I should make it RCH2, sorry. And how do we get, say, the bromide from the alcohol? What reagent do we use? PBr3, or the chloride? SOCl2. These are not oxidizing or reducing agents, right? The elements are in their normal thing. So we can go down without using an oxidizing or reducing agent. Now, how could we get from here, from an alkane, over to here? How would you put bromine in, say? What reagent would you use? If you had an alkane and wanted to make an alkyl bromide? What reagent? Professor J. Michael McBride: No. That’s very good. If you have an alkane, so C-H bonds, and you want to make C-Br, Anybody remember a reaction to do that? What’s the problem in reacting an alkane? Professor J. Michael McBride: They’re not reactive. Why not? No high HOMOs, low LUMOs. No functional group. How do you get at something that’s not a functional group? How do you get at the hydrogens? You can’t use HOMOs and LUMOs. How would you change methane into methyl bromide? Professor J. Michael McBride: Br2, Cl2. It’s a free-radical chain reaction. But notice the things you’re using. Br2, Cl2 are oxidizing agents. So to go across in this direction, from one column to the next, you need oxidation. Or you could do another oxidation, and get RCHX2. And that would require from here, doing a second free-radical substitution. But if you came down from the aldehyde to get there, it’s the same oxidation level. So you don’t need something like bromine to get from here down to here. We could do alcohols, too. And of course, we could go also to the tribromide, RCX3, say. And that we could get from an acid, without using an oxidizing or reducing agent. But if we have to get it from anything over here, from an alcohol or from an aldehyde, we have to do oxidation to get that, somewhere. And the ultimate one is like CO2, would be carbon tetrachloride, for example. That’s the completely oxidized form. Or if we have alkyl halides, alcohols… here we had an alcohol. But suppose we made a diol. R, C, (OH)2, and with H in here, RCH(OH)2. If we’ve started from an alcohol to get that, we have to do an oxidation, choose an oxidizing agent. But if we could make it from an aldehyde without using an oxidizing or reducing agent, can you think of any way of going from an aldehyde to a carbon that has two alcohols on it? Do you remember what you call a carbon that has two OHs on it? Professor J. Michael McBride: A gem-diol. Where do you get it? Professor J. Michael McBride: So we need to do an oxidation, like bromine or something like that? No. We immediately see you don’t, because they’re in the same column, right? It’s the same oxidation level. So you remember how you make a diol from a– let’s do that here. R, C, OH, and I want to get R, C, OH, OH, H. What do I do first? Derek? Professor J. Michael McBride: Protonate the oxygen. Plus charge here. Student: And then an OH- comes and attacks this. Professor J. Michael McBride: OH-. So we’ve added H+, OH-. It’s more likely, if you’re using acid catalysis, that there’s very little OH- around, right? Because the acid would have reacted with it. So what would you normally use to come in to make the C-O bond down here? Professor J. Michael McBride: Water. And then lose a proton. So the proton is just a catalyst. But notice what we’re using is just water. And H+ catalysis. Or OH- catalysis, too. You could have hydroxide add first, and then this pulls a proton off water. OK. So you go up and down using just water and acid. Things that aren’t oxidizing or reducing agents. So you can see how that might work out, that if you that create on your study sheet a list of oxidation levels of things, then you could see, when you’re faced with a given problem, whether – what kind of reagent you need to choose. And if you can simplify to a third of the reagents you know, that’s a big help. OK, now. So that’s just the bookkeeping. There’s also the question of the mechanism by which you do this. So let’s just consider Br2 as an oxidizing agent. So if you have an alkane, RCH3, say, and you react it with Br2 to get an oxidized form, RCH2Br, what’s the mechanism by which you do it? We just did this. Chris? Professor J. Michael McBride: It’s a free-radical one, right? So we get Br•, taking the hydrogen, and we’ve done this before. Get the radical, and then free-radical chain reaction. So bromine is an oxidizing agent, but acting as SOMO. It’s different with alcohols. Suppose we have Br2, and we want to react it with an alcohol. How does the reaction begin? I mean, it would be possible to do it by a free-radical reaction, right? If you put in an initiator, and get change going, it would be possible to do it. But there’s a better reaction to react Br2 with ethanol. And how does that begin? Amy, what makes Br2 reactive? High HOMO, low LUMO? What’s high HOMO? Professor J. Michael McBride: Unshared pairs. What’s low LUMO? There are not many orbitals there. Professor J. Michael McBride: σ*. OK. So we’ve got σ* here. And what’s high HOMO, then, of the alcohol? Amy? Student: The lone pair on the O. Professor J. Michael McBride: OK. So lone pair on the O. Let’s see how these work. Student: It attacks the σ* and takes one of the Br’s. Professor J. Michael McBride: Right. I want to do this with a red… Actually, that’s no better red than the other one. OK. So this comes in here, and these leave. And we’ve seen things like this forever. So we have H, O, Br. And let me write this with this unshared pair, just to be cumbersome about it. And bromide came away, and there’s a plus charge here. How do we get rid of the plus charge? Amy, you’re doing this here. Student: Will the H leave? Professor J. Michael McBride: Yeah. The proton will go away. So now we’ve got O, Br– I was going to make that– CH2CH3. And here we’ve got this, that pair. And now can you see anything that this might do? What reactions have we seen when we have atoms next to one another, bromine on one, hydrogen on the other? Professor J. Michael McBride: Pardon me? 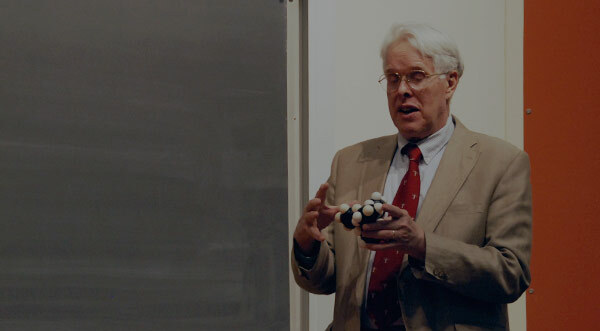 Professor J. Michael McBride: An E2 reaction. So we have some base. It doesn’t have to be a strong base. It could just be the alcohol. Or it could be the bromide that we lost here. So this can take the H, this goes in, and these go on the bromine. So now we have double bond O. This H is still there. CH3. And bromide, which has that pair of electrons. So we’ve oxidized the alcohol to the aldehyde. We’ve gone from here to here. And notice what the trick was. The first oxidations and reductions we talked about were electron transfer, an actual electron transfer, like from a metal to a σ* bond of an alkyl halide, right? Here we’re transferring electrons, but in pairs. The electrons start belonging to the oxygen. Then they’re shared between the oxygen and the bromine, and then they leave with the bromine. So the bromine came in and shared a pair of electrons, then went away, carrying them away. So it removed this pair of electrons. That’s how the oxidation occurred. So these reactions are just… This is an SN2 reaction, and this is an E2 reaction. So they’re just normal mechanisms, but because of the way we look at it, it’s an oxidation-reduction reaction. And now CrO3, Cr+6. It reminds you a little bit of a ketone, Right? this Cr=O. So you can imagine adding water to give Cr, O, O, OH, OH. What’s the oxidation state? If the chromium is oxidation state here, what’s its oxidation state here? Professor J. Michael McBride: +6. What’s its oxidation state here? Professor J. Michael McBride: What? Professor J. Michael McBride: How do you know? You could add up all the bonds. But if you used water, it’s going to be the same oxidation state, because water’s not an oxidizing agent. So it’s still +6. Or you could imagine having two of these– so these are a little bit like alcohols. You could imagine to make an ether from that. So you could have Cr-O-Cr, right, with O, OH, OH– wait a second, O here—O, O, OH. But all of these are just different disguises of the same thing, Cr+6. Now let’s consider the reaction of any of these with an alcohol. Like H, O, CH2, CH3. So we can have the unshared pair– and I’ll do it in red again– attack the chromium. So we’ve got H, O, Cr=O, double bond O, O- or OH. Let’s do the OH. And now notice that we’re in the same business we were with bromine. We have now– let me write this out so that it looks like the one over there. H, H. So now we could bring up some base, take this H, this goes in here. And the chromium leaves with that pair of electrons. So again, just as before, we’ll have lost the proton. It looks just like what happened over there. The chromium came in, shared the pair of electrons, and then left with them in the elimination reaction. Right? So again, it’s an oxidation. And if we could look at the chromium afterwards. It’s Cr, O, O, OH. And what’s – am I right here? Minus. So it’s got one, two, three, four, five that it’s giving to oxygen, but it gets an electron back with the minus. So this is +4. So chromium goes from +6 to +4 in the process of doing this oxidation. Now, there’s a problem in doing this to make an aldehyde. And the problem is, when you’re working in water, if the product you’re going to get here from this elimination– you’ve lost this proton, you lose this H, break this bond, so you have C=O. Now, if that’s what you want to make, there’s a problem. Because aldehydes, you know, have an equilibrium constant about one with water. So this is going to add water to make a diol. And why is that a problem? Because alcohols react with chromium trioxide to get oxidized. So you could lose this. So this oxygen can give up its pair of electrons, get oxidized. You lose this H and this H. And then you would have OH, C=O. So you over-oxidize all the way to the carboxylic acid. We go on another step up there. Now, how can you avoid that problem? Let me get this back down. You could do it by making this, the reagent shown here. Pyridinium chlorochromate. So notice, you added HCl to CrO3, which made chlorochromic acid. And then the proton is given to pyridine to make a pyridinium cation. Now, that is organic enough that it’s readily soluble in organic solvents, which the other forms of chromium that we talked about are not. Now, can you see what advantage that might provide, to do it in an organic solvent rather than in water? So the reagent is called pyridinium chlorochromate. And here’s an example where you get a 92% yield of the aldehyde from a straight-chain alcohol using pyridinium chlorochromate. The crucial thing is the solvent is methylene chloride, CH2Cl2. Right? No water, no gem-diol, and therefore, no over-oxidation. Because the mechanism requires the alcohol to react with. I took that example from Lauden’s textbook. You’ve gotten a rose-colored picture in your lab. I mean, you’ve often had frustrations, I know. But those reactions are carefully chosen so you don’t get sticky, black tars. But you find very often, when you try to do something in organic chemistry, you get something that’s very difficult to filter or deal with. And that can happen in this reaction. Oh, sorry. We’re going to have to carry on with this next time. Thanks.